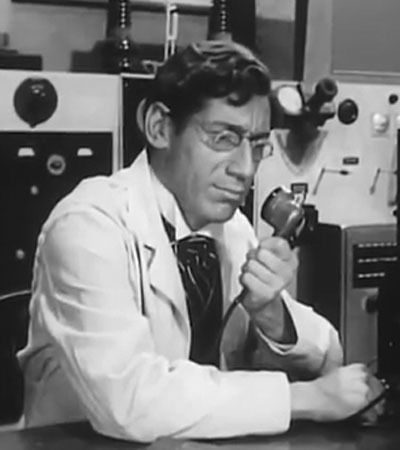 Above: Michael Fox as Dr. Grood in the serial The Lost Planet (Columbia, 1953). 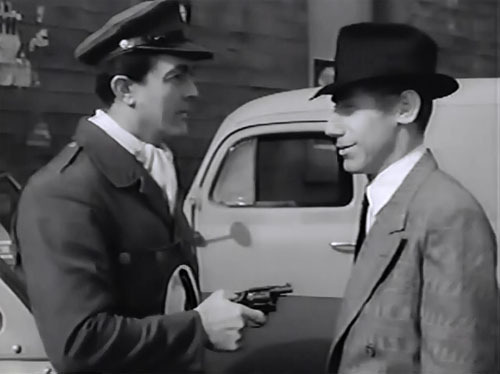 Former stage actor Michael Fox was one of the serial genre’s very last notable villains; before beginning a long career as a television character player, he portrayed the chief heavy in three of Sam Katzman’s 1950s cliffhanger efforts. Fox possessed all the qualifications of a top serial brains heavy; his smoothly authoritative voice, arrogantly confident manner, slyly intelligent face, and subtly theatrical screen personality were ideally suited to master-villain roles–although his biggest and best-remembered chapterplay characterization was more notable for humor than for menace. Michael Fox was born in Yonkers, New York; he did some school-play acting during his youth, but studied history while in college, in hopes of becoming a teacher. This plan never came to fruition, however; instead, Fox wound up spending several years as a peripatetic railway brakeman, working for multiple railroads across the country. By 1945, he had landed in California, where he started a new career as an actor after auditioning for a Los Angeles theater group. His background in history subsequently helped him land a role in the play “The Story of Mary Surratt,” a Dorothy Gish vehicle centered around the Lincoln assassination; this production successfully toured the West Coast, but folded not long after arriving on Broadway in 1947. After “Surratt” closed, Fox did some radio work in New York and then returned to California, where he took a haberdashery job and began auditioning for theater groups again; he soon became both an actor and director for a Los Angeles group known as the Players’ Ring. In 1952, while performing at the Ring in “Home of the Brave,” he was “discovered” by Harry Sauber, an associate of producer Sam Katzman; Sauber introduced Fox to Katzman, and the actor soon began appearing in the feature films and serials that Katzman produced for release by Columbia. 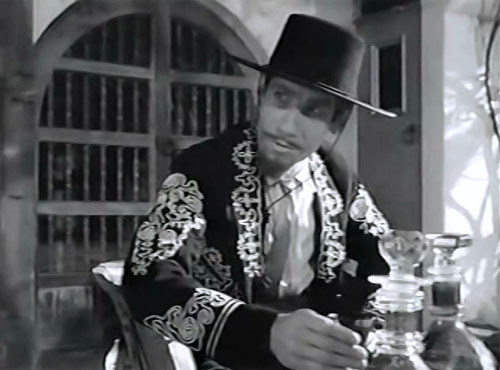 Fox made his screen debut in a bit part in the Katzman film A Yank in Indo-China (Columbia, 1952), but was playing larger roles for Katzman before the year was out–in the features Voodoo Tiger and Last Train from Bombay, and in the chapterplay Blackhawk. Fox’s screen time in this initial serial was limited, but he was still given a more multifaceted acting showcase than in any of his subsequent chapterplays. He was heard regularly throughout Blackhawk as the voice of the Leader, a Communist spymaster who regularly radioed orders to the serial’s principal active-duty villain, Laska (Carol Forman); however, Fox got to engage in active villainy himself in the serial’s second half–not as the Leader, but as another character named William Case, a member of the US “Defense Council” who was secretly in league with Laska’s espionage ring, and who played a prominent part in said ring’s attempt to steal a valuable synthetic fuel protected by the spy-fighting Blackhawk (Kirk Alyn) and his team of aides. The cunning and traitorous Case was finally killed in a fall from a plane in Chapter Fourteen–only to reappear in the next (and last) episode, in which he was unmasked as the Leader himself; the deceased Case was off-handedly dismissed as a double created through plastic surgery. 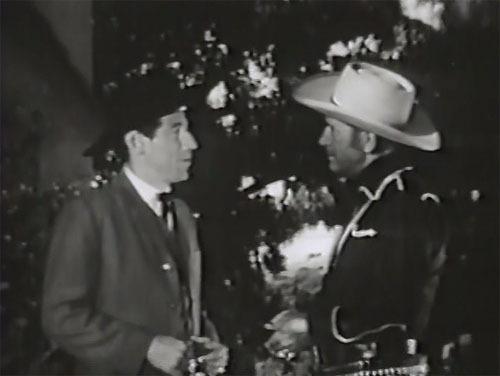 Fox handled his “Case” scenes in Blackhawk with highly entertaining slyness and suavity–adopting an affably mild-mannered pose when Case was pretending to assist Blackhawk (Kirk Alyn), adroitly handling Case’s later impersonation of a genteel Mexican rancher (complete with accent), and craftily parrying with the heroes once his trickery was exposed. He was also very good in his brief recurring scenes as the Leader–in which he deepened his voice, gave it a slight hint of a Russian accent, and then boomed out commands and rebukes to Laska with cold and arrogant authoritativeness. 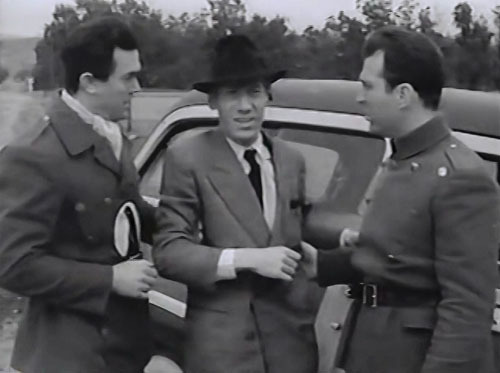 Above: Michael Fox tries to convince Kirk Alyn (left) and John Crawford that he’s been the victim of a robbery in Blackhawk (Columbia, 1952). Above: The disguised Michael Fox offers his hospitality to the off-camera Alyn and Crawford–while asking some pointed questions–in another scene from Blackhawk. Fox stayed a member of Katzman’s stock company throughout the 1950s, but also did a fair share of work for other movie producers–among them Ivan Tors (for whom he served as both actor and dialogue director, in several science-fiction features) and Universal’s Albert Zugsmith; from 1954 onwards, he also made television appearances on a frequent basis. His next serial was Katzman’s The Lost Planet (Columbia, 1953); this outing has proved the most famous of Fox’s chapterplays–thanks to its embarrassingly low-budget sci-fi trappings and to its memorably ridiculous screenplay, which was so crammed with jaw-breaking technobabble and plotting absurdities that the serial came off as more of a parody than anything else. Planet ostensibly starred Judd Holdren, but Fox–as the villainous Dr. Ernst Grood, ruler of the planet Ergro and would-be conqueror of Earth–easily stole the serial from him, delivering a hilariously quirky and irritable performance that wasn’t at all menacing, but was very funny. He spouted pseudoscientific dialogue with aggressive self-assurance, bristled comically whenever he was outsmarted by captive scientist Professor Dorn (Forrest Taylor), reacted to technological setbacks with petulant indignation, inflated visibly when he was flattered by satellites or enemies, and gloated pompously whenever he achieved temporary success. All in all, his character came off as a conceited, somewhat insecure intellectual blowhard who desperately wanted to be a scientific master villain, but who knew, deep down, that he couldn’t quite make the grade. 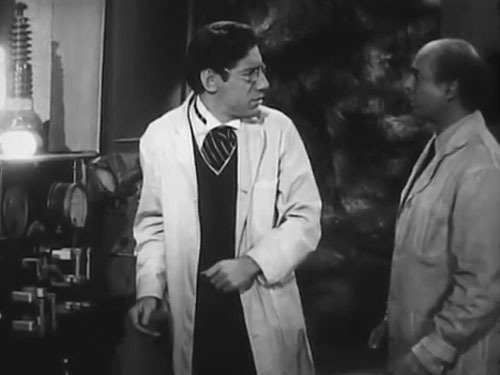 Above: “The quadro-oscillator operated in reverse; there’s a wrong connection in the circuit!” Michael Fox’s Dr. Grood frustratedly tells his assistant Jarva (Jack George) of another gadget malfunction in The Lost Planet (Columbia, 1953). 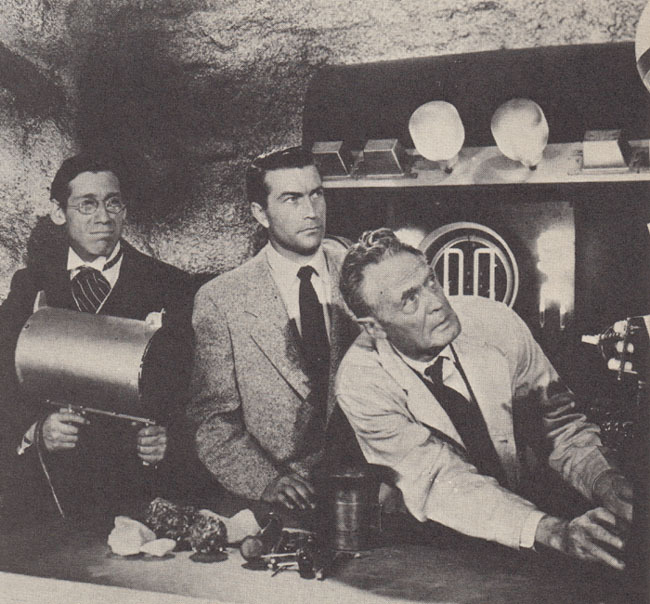 Above: Michael Fox, Judd Holdren (center) and Forrest Taylor in a publicity still for The Lost Planet. 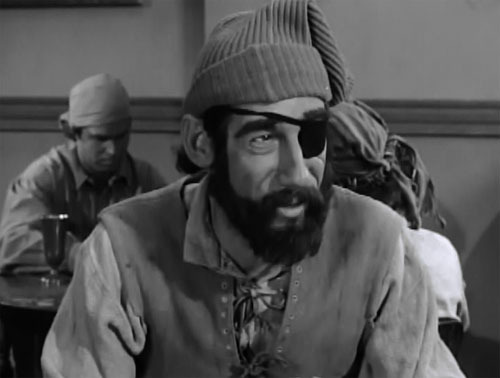 Later in 1953, Fox played a small character role in the Katzman-Columbia serial The Great Adventures of Captain Kidd, appearing in its second chapter as a rough-hewn, bushy-bearded, and eye-patched seaman named Elias Smith, who gave the heroes (Richard Crane and David Bruce) a vivid but false account of the supposed evil deeds of the famed privateer Captain Kidd (John Crawford). Fox, almost unrecognizable beneath his piratical makeup, obviously enjoyed himself in this colorful bit, growling out his dialogue with gruffly ferocious gusto and narrating a flashback sequence in cynically disgusted fashion. Above: Michael Fox in The Great Adventures of Captain Kidd (Columbia, 1953). Above: Michael Fox congratulates Jack Ingram on dirty deeds well-done in Riding With Buffalo Bill (Columbia, 1954). 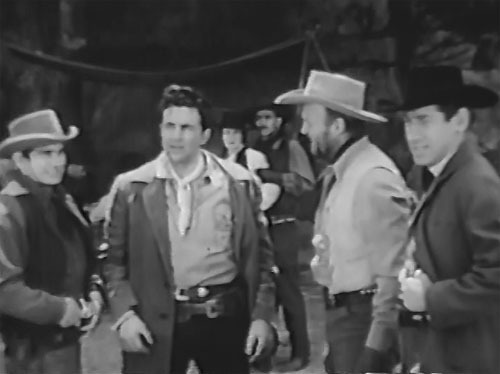 Above: Michael Fox chides the off-camera Jack Ingram for recruiting unruly henchman Rick Vallin (second from left) in Riding With Buffalo Bill; Gregg Barton is between Vallin and Fox, and Shirley Whitney is being held by Steven Ritch in the background. Fox’s last serial was Adventures of Captain Africa (Columbia, 1955), another Katzman stock-footage patchwork. 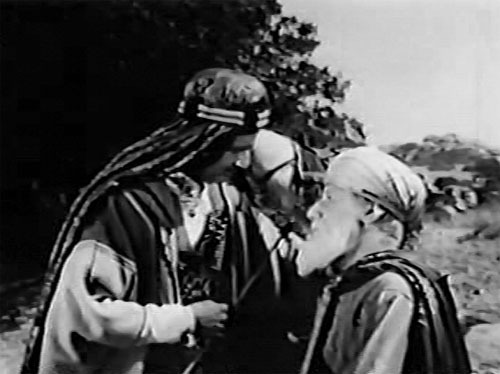 Wearing a white beard in order to match stock shots from the 1944 serial The Desert Hawk, he received a couple of brief scenes and a mere handful of lines as a gravely dignified Arabian prime minister, who was rescued by hero Rick Vallin after being kidnapped by outlaws. Above: Michael Fox thanks Rick Vallin in Adventures of Captain Africa (Columbia, 1955). Fox’s television appearances began to outnumber his feature-film roles during the second half of the 1950s; he played a regular role on Warner Brothers’ short-lived Casablanca series, and guested on shows ranging from Science Fiction Theatre to The Rifleman. By 1960, he had become, as far as the film industry was concerned, almost exclusively a television actor; he stayed one throughout the 1960s, 1970s, 1980s, and the first half of the 1990s–doing one-shot character turns on innumerable series, and playing recurring roles on Perry Mason, 87th Precinct, Burke’s Law, and (towards the end of his career) the soap operas Falcon Crest and The Bold and the Beautiful. During his decades in television, Fox continued to do stage work, appeared in occasional feature films, did a bit of radio acting, played a key part in a famous 1970 psychological study, and–in his later years–visited some science-fiction conventions. He made his final screen appearance in a 1995 episode of NYPD Blue; a year later, he died of pneumonia in Los Angeles. Michael Fox’s wonderfully off-the-wall performance in The Lost Planet has tended to overshadow his other serial work, and has prevented him from receiving much recognition as a serious serial heavy; however, he showed in Blackhawk (and even, fleetingly, in Riding With Buffalo Bill) that he could handle genuine villainy just as skillfully and enjoyably as he did comic villainy. One wishes that he’d entered the cliffhanging world sooner; his urbane, wily, and self-assured evildoing could have improved any number of post-war serials. Above: Michael Fox indulges in a smugly evil smirk, despite the presence of Kirk Alyn and his gun in Blackhawk (Columbia, 1954). Acknowledgements: The federal censuses, my usual primary sources, failed me this time–since I was unable to find out Fox’s real name, and thus didn’t have a starting place for my search. However, the California Death Index gave me his birthplace and his birth and death dates–and Tom Weaver’s long, thorough, and very interesting interview with Fox in It Came from Horrorwood (McFarland, 1996, originally published as It Came from Weaver Five) gave me all of the other biographical information I needed. Boyd Magers’ short Serial Report piece on Fox was also helpful; info about Fox’s performance in the well-known–and hilarious–“Dr. Myron L. Fox” psychological study can be found here, while the performance itself can be viewed here.